Guy Fieri finds himself at the receiving end of many quips, but that doesn't mean the spiky-headed celebrity chef isn't adored by a plethora of fans. Bill Grella of Leeburg, Virginia might be the most passionate Fieri-disciple, as he recently completed the milestone of eating at 600 restaurants featured on Fieri's popular program, Diners, Drive-ins and Dives. It was no small order, as Grella has logged many miles traversing the United States to complete his Donkey Sauce-fueled pilgrimage. Luckily, he documented every single morsel of fried, cholesterol-laden goodness he encountered along the way on his personal blog, Diners, Drive-ins and Dives Adventures. For his 600th day mirroring the gastronomic tendencies of Guy Fieri, Grella visited the The Carving Room Kitchen and Bar in Washington DC. He had a sandwich consisting of "Roast Lamb on Ciabatta with Bacon-Cheese fries on the side and a pickeled veggie garnish," which sounds like a meal Fieri would enjoy. Speaking about his milestone with Fairfax Station Connection, Grella didn't speak in a Fiery-heavy patois, although he did describe his experience in great detail. In truth, Grella sounds humble about his rib-devouring odyssey. Grella adds that there is a certain allure about following in Fieri's enigmatic footsteps: “Every time I get to a milestone, I say I’ll slow down, but something always pulls me back." 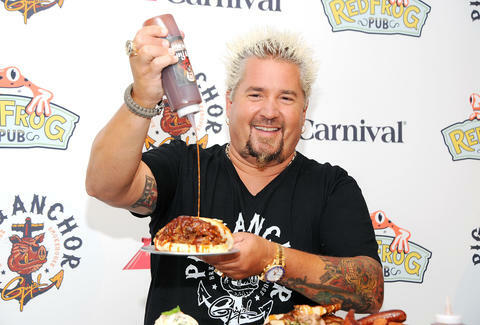 Perhaps it's the mysterious phenomenon known in the restaurant world as the Fieri-effect? While Fieri will forever be the Mayor of Flavor Town, USA, perhaps Grella has earned the right to call himself the city's treasurer. After all, you'd be hard pressed to find someone as well-versed in the tao of Guy.